On my first visit to Boston in the early 80’s to have lunch with my play publisher, I had built in plenty of time to visit the typical Beantown tourist attractions – walking the Freedom Trail, visiting Paul Revere’s House, the Old North Church, the U.S.S. Constitution. It wasn’t until I was lunching one day at Ye Olde Union Oyster House that I got the distinct impression I wasn’t alone. Situated in a building that predates the Revolutionary War, the restaurant sent my imagination into overdrive thinking about how many luminaries and common folk regularly crossed its threshold to discuss political news of the day. 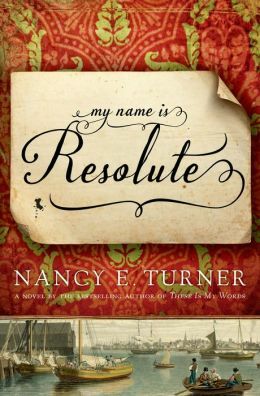 I was reminded of that experience when I recently immersed myself in Nancy E. Turner’s compelling page-turner, My Name Is Resolute – the story of a young girl kidnapped by pirates in her native Jamaica and taken to a bewildering new world where only the strongest, cleverest and luckiest have any chance of survival. Q: Tell us about your journey as a writer and when you first knew that this was what you wanted to do. A: I told a teacher in fifth grade that I wanted to be a writer when I grew up, but I always held the belief that a writer had to start with having a PhD of some sort. It wasn’t until I finally got a chance to go to college along with my children that I found this wasn’t entirely true. Q: Were you a voracious reader when you were growing up? If so, what are some of the books we might have found on your nightstand as an adolescent and as a teen? A: I always read. My parents kept us enrolled in library book clubs and they had walls of bookshelves crowded with volumes. I loved Harriet the Spy, Laura Ingalls Wilder’s Little House on the Prairie series, The Five Little Peppers and How They Grew, and as a teen, anything involved with science fiction. Although I cut my “adult” teeth on Gone with the Wind at 9, I centered my teen reading on Isaac Asimov, Ray Bradbury, and Robert Heinlein books. I was a “trekky” before it was cool and read Star Trek novels too. While many of my friends loved the Hobbit books, the closest I got to Tolkein was Alfred Lord Tennyson’s Morte d’Arthur and White’s Once and Future King. A: Just finished Jeff Shaara’s newest called The Fateful Lightning, before that Fifty Dead Men Walking by Martin McGartland and Empire of the Summer Moon by S. C. Gwynne. Next on the list is Circling the Sun by Paula McLain. Q: If you could sit down for lunch with one of your favorite authors (living or dead), who would it be, where would you go, and what question would you most like to ask him or her before that meal was over? A: I’d have a long lunch with Earnest Hemmingway on a balcony porch in Havana in the springtime. I’d like to know how he came to craft his work with the narrative voice he used – whether he’d tried other styles, admired other authors, whose work he liked to read. I suspect, however, he was his own editor from the beginning. I think he’s a fascinating character in his own right. And then, if I answered this question tomorrow, I might choose someone else. Q: Each of your best-selling novels thus far utilizes the backdrop of bygone eras and you have a wonderful quote on your website that says, “Writing historical fiction is much like working on a term paper every day.” The level of detail that goes into so vividly recreating the past – and, in the case of My Name Is Resolute, displaying a solid understanding of British laws – requires copious amounts of research. Share with us some of your techniques for fact-finding, fact-checking, and ensuring that the text doesn’t become so overstuffed with all those facts that the fiction itself gets lost. A: In one of the first classes I took on writing technique I learned never to “let the author dash out onto the stage and explain things like a Greek melodrama.” I’ve never forgotten that warning. There is much the author has to know to inform the writing without telling the reader all about it. In one of my novels I had come to a new chapter and wanted Charlie to have a conversation with his mother Sarah as he’s getting ready to leave home. The purpose of it was to show he was 1) a grown and determined man, not a boy; 2) an experienced hand with a gun even at twenty; and 3) eager for better technology. A week of searching historical weaponry in 1900 yielded this line of dialog: “Look at that. Krags with the rim out.” Does the reader know what he means? Not until he pushes the box of ready-made bullets toward his mother for her response. A reader doesn’t need to know what the development of rimless brass projectile casings does to the velocity and accuracy of a rifle. But, they immediately believe that Charlie and Sarah both know, and that is enough. In each of my novels, and in My Name Is Resolute most recently, I immerse myself in their worlds. I walk the streets where they have walked. Smell the woods, steep my stories in the shadows and sunlight, the desert heat, the gloom of a New England winter. I listen to period music, and do the chores the characters do. It frames the foundation of the entire novel. You walk into a dark room and flip a switch. There is light. You don’t need a treatise about theories of electricity to use the light. But, before the room was built and furnished and the lamp placed just so, someone did need to construct it. That, to me, is the writer’s job as researcher – to construct a world in which a reader can move with alacrity, seeing what they need to see to follow the story. Fact-finding starts with reading. It must also include traveling to the places to do it well. Photos, leaves pressed in notebooks, touring reproductions of early whaling ships, a freshening breeze off shore in Jamaica, the smell of mutton-fat candles, a barn full of goats and a murky Maine seashore, the taste of hard cider, the cobbles of old Boston. Luckily there are books, maps, and writings from the period. I’ve discovered free access online to historic works in the public domain that shed invaluable light on the world of Resolute Talbot. I kept favorite websites about British currency in the eighteenth century, clothing styles, social mores and religious and civic law, among dozens more. Until I started researching for Resolute, I had never known a person could be arrested for wearing the wrong hat or a calico gown not befitting their station in life. Imagine that cotton calico was reserved for the rich alone! I wanted to know more than the dates of battles of the American Revolution. I wanted to know what made the people tick, what kept them alive and motivated to engage in a war, when circumstances were desperate just to survive. A: Resolute was a wonderful character to write and to know. One of the things she surprised me with was the depth of her anguish and anger at being taken from her life of privilege and made a slave. Of course, I reminded myself she was a child, and children can be incredibly hostile in times of desperate stress. Her anger at her sister Patience was part of her desperation, and the feeling that both Patience and August had abandoned her put an edge on every choice she made. She became wary and subtle almost beyond what I imagined. I had a vague idea of where I wanted to end the story, sometime during or just after the Revolutionary War, and I was at first surprised at how old Resolute would be by that year. However, research showed that if a person survived childhood diseases which included measles, yellow fever, smallpox, great pox (chickenpox) injury, infections, and childbirth, she could easily live to a great age and still be quite vital. They ate food untainted by chemicals, vegetables from their gardens, very little sugar, and did aerobic exercise just getting through the day. Many towns had a few venerated citizens of eighty- or ninety-plus years. Q: Did you work from an outline or allow the story to unfold in your head from chapter to chapter? A: I knew where the story began, before I put a single word down. I started with the title, a rare occurrence in novels. I knew Resolute would survive the War, but little beyond that. One of the beginning themes was her longing to go home to Jamaica, but it wasn’t until I was almost at the end that I knew whether or not she would get there. In the end, her choice in the matter is the pivot of the story. Much of the meat of the novel developed through research in how she would have lived, the people around whom she’d have been surrounded, and the politics of the revolution. Q: My Name Is Resolute weighs in at a hefty 585 pages. How long did it take to write from start to finish? A: The novel was in progress a good two and a half years. The last six months I spent cutting it down to size. My original manuscript was 830 pages. Q: This book also seems to have feature film or mini-series written all over it. If Hollywood came calling, who would comprise your dream cast? A: That’s so much fun to imagine. I picture Karen Sheila Gillan as Resolute. Gerard Butler as Cullah. As Patience, Amy Adams. Ewan McGregor as Wallace Simpson, Russell Crowe as Cullah’s father and, Liam Neeson as Rafe MacAlister. Q: I especially enjoy it when fictional characters cross paths with luminaries of the day – in this case, John Hancock, Paul Revere and George Washington. Have you used this device in some of your other titles (or plan to in future works)? A: I thought long and hard about including names of real people. In general, I try to keep the true history as a backdrop for the stage upon which my characters tell the story. However, I discovered that on the dates in question, George Washington was traveling across Massachusetts, and would have stopped and eaten only with a family whose loyalties had been vouchsafed by trusted officers. There was a price on his head, as you can imagine. The Revere family was a very well known presence in Boston society, and Resolute had crossed a tenuous line from a society where everyone kept to their “level” as a weaver, when she made friends with Margaret Gage. Margaret Gage is reputed to have been the one to “spill the beans” about the imminent march of soldiers toward Concord. She knew the Reveres, and her husband, General Gage, was in command of the British Army stationed in the Colonies. I inserted Resolute as the go-between from Margaret to Paul Revere, to make her part of the story a pivot point. John Hancock was perhaps the most colorful character in real life, and hard to ignore. Anyone who knew anyone in Boston, knew him or knew of him. He was a known smuggler, a rebel, and a man not to trifle with. His efforts to defy the British rule seemed to color every account I read. To have Resolute’s daughter develop a teen-aged “crush” on the most eligible bachelor in town seemed logical. He was dashing, elegant, handsome, and the richest man on this continent at the time. I felt I could not tell Resolute’s story without including those real people, though I worked carefully not to have them do or say anything no appropriate to their real lives. As far as using this as a device, each novel seems to take what it needs of real lives and real life. The only novel I’ve written that is purely fictional is The Water and The Blood. There are references to WWII and President Roosevelt, but no real people ever walk on stage. There are characters in each of my other books that are very real people, though a reader may not recognize their names as handily. In These Is My Words, the children go to a one-room school taught by Miss Wakefield who soon marries the owner of the general mercantile, Mr. Fish. Tucson still has a Wakefield Middle School named in her honor, and the Fish name is laced through the town history in many places. Ronstadt’s Livery Stable is owned by the great-grandfather of singer Linda Ronstadt. General Crook really commanded the Sixth Army in Tucson. Very real people. To me, it’s just a nice way to add verisimilitude to a tale. I don’t really plan to use or not use real people. It’s all about what the story needs to be present in the imagination of a reader. Q: Tell us about your Sarah Prine series and the real-life connection that inspired it. A: The real Sarah Agnes Prine was my great-grandmother. Stories abound among her children and grandchildren, but not much actual documentation existed when I began. All I knew was what I’d been told – that she was courageous, hard-working, smart but uneducated, and that she could out-ride and out-shoot her brothers. I changed all the names of real people except hers, just so I wouldn’t offend anyone. In 1950 the local paper in the small town where she lived ran an article about “Granny” finally retiring from active ranching at 75 because she couldn’t hit what she was aiming at with a lariat any more. Never mind she was on a horse throwing one. Also, she complained that her “little” double-barrel shotgun was “out of fix.” I imagined that her life was colorful, difficult, and strenuous. Her mother lived until she was 105 or 106. Sarah passed at 96, her youngest daughter, my grandma, was 95, and my mother is still gardening at 84. After growing up in far distant California, isolated from most of the family by distance, once the first novel came out, I heard from people all over the country who I can now claim as cousins. I’ve been informed by some that there are plenty of “fish tales” in that novel, the dates are accurate to history but not to her life, but it was never meant to be a biography. It was simply a way to connect to a woman I wished to know, and through her to create a character I could aspire to become were I in her position. Jack Elliot, the romantic lead and Sarah’s soul mate, is modeled largely after my husband John. After serving in the Infantry in Vietnam for a year he became a police officer and retired after 33 years on the Arizona Highway Patrol as a supervisor. He’s a bit of an old lion, now, but yes, he was the inspiration. Always was and always will be a man who would run into a burning building, not away from it, to save someone he doesn’t even know. Q: Which do you feel is more challenging for you – to pen a series with recurring characters or to do a stand-alone book? A: I much prefer thinking about a stand alone novel than a series. I actually never meant to do a series, but the publishers were adamant that I at least make a try at it. I’m just lucky the other books sell as well as These Is My Words. The reason for me is simple. I prefer to read a stand alone book. I don’t really want to have to find out in “the next installment” what’s happened to my favorite characters. I was advised by my agent and considered splitting My Name Is Resolute into two books because of its length. However, no one, myself included, could find a place halfway through the story that made a good ending for one part and a good beginning for the next. I felt that if a person read the second installment first, it could not contain adequate examples of the motivation for Resolute and the other characters to do what they did. The first half, or first book, would have to stop when she was a child and had not really accomplished what she’d come to life to do. I finally decided the story had to remain whole, and ultimately, the editors agreed with me. A: My writing usually doesn’t happen on a schedule. When I’m deep into research, I read into the wee hours of the night. If I read in bed I usually fall asleep with something like Lemuel Shattuck’s History of Concord on my chest. I don’t mind. I just pick it up in the morning and start over. Writing itself is not about sitting in front of a computer. I work out scenes while I’m planting flowers, or walking the dogs, or sitting in a boring meeting. The actual work of typing the story is pretty much taking dictation from the voices in my imagination who have already “run” the dialog and action several different ways. Yet, just getting it down on paper, or on a screen is never the end. Then the real work starts, the fun part. The editing. I love the work of going over each and every sentence, and deciding whether it says what it needs to say, uses the best words for the task, and if I can eliminate anything superfluous. I ALWAYS work to a sound track of music that inspires the stories. I wouldn’t bother you with the lists, but it’s probably a result of having grown up in the television era – every good movie needs a sound track. I spend many hours assembling a list of mostly instrumental music that keeps the story playing out in my head. I rarely if ever have experienced a writing block because when the music starts, the curtains lift, and my cast take their places on cue. A: I struggle after the end of each novel with whether I can do it again. It’s like giving birth to a huge baby after a two or three year gestation. You’re just not in a hurry to be “with book” very soon. You need that toddler to get out of your head before the next one comes along. I sometimes miss my characters very much once I’m done with their stories. Very much. A: I’m doing some research on Texas history. I started the research before I saw the recent TV series called Texas Rising. It’s a good series, but while it doesn’t really have anything to do with the story I’m pondering, there is nothing wrong with letting someone else’s take on a historical situation add flavor and fire to what I’m thinking. I need to leave any more description of it there. It’s far too nebulous a bubble to expose to much scrutiny yet. Might burst. Q: Where can readers learn more about you (and buy your books!)? A: My website is www.nancyeturner.net. Just remember the initials, NET. There are a few fan pages around, and Facebook. I haven’t yet begun Twitter and I’ve just heard it’s passé so I don’t know if I should. The books are for sale at all major chains and local bookstores. Amazon.com, BarnesandNoble.com, and any place you normally buy books. A: I appreciate your taking the time to feature my novel on your site. My Name Is Resolute is, I think, my finest work, and if I were never to write another, I could retire happily knowing Resolute has told her story.